You are a farmer fighting space aliens with a corn harvester in this arcade style game. Publisher’s description: The Aliens have arrived! And all they want is your corn! 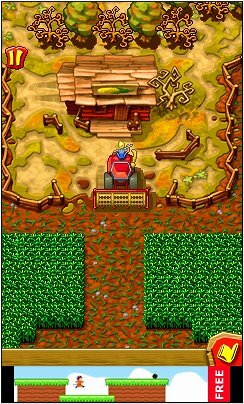 Defend your fields with the old corn chopper and tinkered arsenal to spoil the blue men’s appetite for popcorn! Make Redneck Pops proud and welcome your new friends from outer space… the Texan way! The app “Farm Invasion USA Free” (501 KB) is ready to download or send to your phone as filename:”farminvasn1″. The apps and games on this site do not work on Android phones. my i ask a question? Please see the help page at http://boostapps.com/help/ for downloading instructions. Click the download link in this post. You need paid (not free) data to download. Internet.org doesn’t allow downloading apps with free data. Hi dennis…. in my sanyo boost mobile when i start up the game it says “restart in portrait mode” any solution! thx! If your phone doesn’t let you switch to portrait mode you won’t be able to play this game. Which Sanyo phone is it? Incognito or Innuendo? Works on the Innuendo perfectly. I have had this game for 6 months and it’s hard to beat. Another excellent full screen game from Handy Games.